Eleven explorers spent the holiday weekend at New River Gorge, taking advantage of absolutely perfect weather. The group spent three sunny days climbing mostly trad and toprope. The group spent Saturday at Beauty Mountain, where we climbed a 5.8 offwidth, some 5.9 cracks, and a couple 5.10 finger cracks (including Matt's project--a 4-year old "sandbagged" him before he left the ground!). While a few headed out early, Day 2 took the remaining climbers to Endless Wall. Most of the day was spent in the Fantasy area, where Fantasy crack (5.8) and Black and Tan (5.10a) were group favorites). The group explored other nearby routes, taking the chance to practice crack climbing and contemplate the difference between jelly and jam. On Monday, the two remaining cars got up at the crack of dawn to jam in a little more climbing before returning to CMU, with one car heading to Ambassador Buttress, and the other to Junkyard. 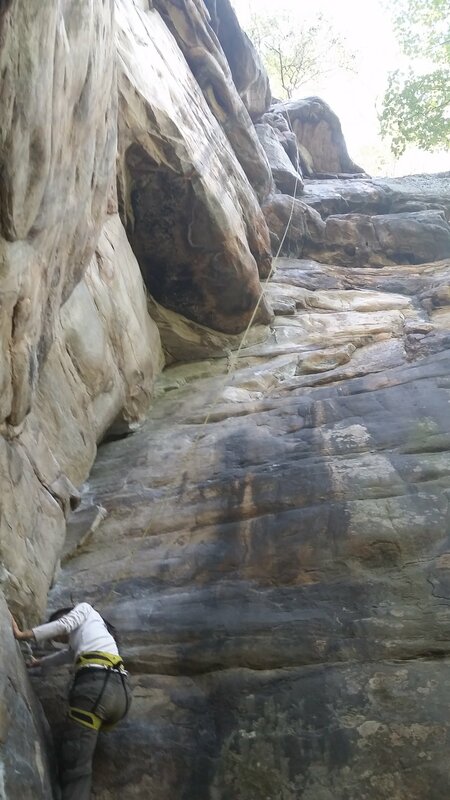 Four Sheets to the Wind (5.9+) nearly ate a cam, but all managed to escape with gear intact.